Adobe Premiere Pro may be the most powerful video editing software on Windows and Mac, and iTunes Store is one of the largest online video store. When Adobe Premiere Pro meets M4V videos from iTunes Store, you may want to edit iTunes M4V video in Adobe Premiere Pro for a new movie project. However, iTunes M4V videos are DRM protected and restricted to various video editing programs including Adobe Premiere Pro. To edit iTunes M4V videos in Adobe Premiere Pro, you need to remove DRM and convert M4V to MP4 with M4V Converter Plus below. Many video lovers use Adobe Premiere Pro to create, edit and produce professional videos for advertising and sharing because Adobe Premiere Pro is probably the most video editing software for both Windows and Mac users. As of March 2018, Adobe Premiere Pro CC allows you to import still images and movies is 256 megapixels, with a maximum dimension of 32,768 pixels in either direction. Besides, Adobe Premiere Pro CC natively supports various video formats including 3GP, 3G2, Apple ProRes, ASF, AVC-Infra, AVI, DV, H.264 AVC, H.265, M2T, M2TS, M1V, M2V, M4V, MP4, MOV, MPEG-1, MPEG-2, MTS, MXF, VOB, WMV, etc. as well as various audio formats including MP3, WAV, M4A, BWF, ASND, AAC, AIFF, etc. Adobe Premiere Pro CC has covered a wide range of media supports, so you don't have to convert video and audio files under most conditions. However, though M4V video format is listed in the supported video format, it only refers to the unprotected ones. M4V videos downloaded from iTunes Store come with DRM protection and can't be improted to Adobe Premiere for video editing. 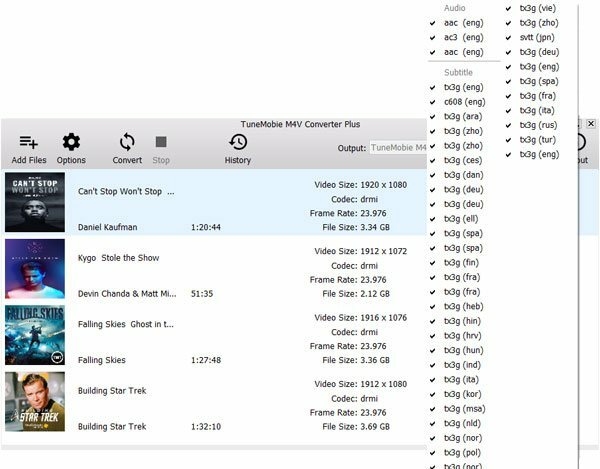 There are many iTunes users who asked on Adobe forums or Apple community about how to edit iTunes M4V movies with Premiere Pro. "Hi, I am looking for editing iTunes videos on Adobe Premiere CC, however, everytime I load a video, it prompts me that the video is corrupted. I checked the movie play perfectly on iTunes. Any help will be appreciated." "I'm wondering whether there's any way to edit iTunes movie with Adobe premiere? It appears the movies in iTunes are protected by DRM and restricted to." Luckily, removing DRM protection of iTunes M4V videos is not that difficult. It's much easiler than your imagination with a professional DRM remover called TuneMobie M4V Converter Plus. 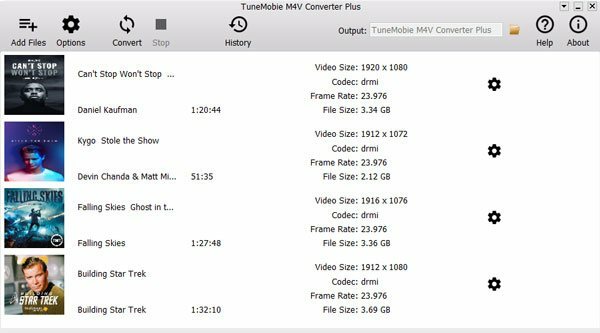 TuneMobie M4V Converter Plus is a dedicated DRM removal software solution for M4V videos including movies, TV shows and music videos from iTunes Store. The Mac version not only works the purchased movies and TV shows, but also works for rental movies perfectly. That is to say, you can convert rental M4V movies to MP4 and add to Adobe Premiere Pro for video editing as well. 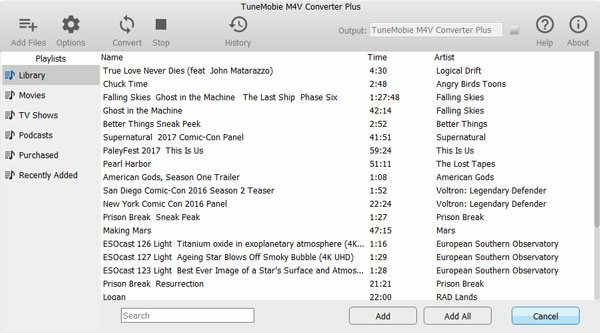 TuneMobie M4V Converter Plus is extremely easy-to-use and any iTunes users can master the program in a few minutes. Let's check the wonderful features of TuneMobie M4V Converter Plus below. Edit M4V videos in Adobe Premiere Pro can be easily done in only a few clicks as below. Launch the program and iTunes will be automatically launched as well. Click "Add Files" button to load all purchased and rental M4V videos downloaded from iTunes Store. iTunes M4V library will be displayed as playlists in the left panel. Select one movie and click Add button, or use Ctrl or Shift key to select multiple videos and click Add. You can use the built-in search box to locate the M4V videos quickly. Now simply click Convert button to start conversion. All selected M4V videos will be converted to plain MP4 without losing video quality. Click History to manage the conversion records and open the output folder. Now launch Adobe Premiere Pro and you can add converted M4V videos to the program for editing. If you are an experienced user, you can skip this part. You can either create a new project or open an existing one. To import media files using the Media Browser panel, browse to the output folder you’d like to import, select the converted M4V videos you want to work with in Premiere Pro, right-click one of the selected clips, and choose Import. You’ll need to create a sequence before you can add the converted M4V videos. 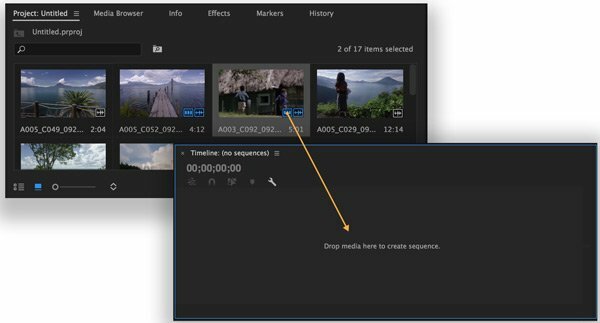 To create a new sequence, drag one or more clips into the empty Timeline panel, or select one or more clips in the Project panel, right-click on the selection and choose New Sequence from Clip. Now, you are ready to edit the converted M4V videos. If you have subscribed Apple Music, you can also want to use favorite Apple Music songs in Adobe Premiere Pro as background music. However, Apple Music also comes with DRM protection and you can use Apple Music Converter to remove DRM and convert Apple Music tracks to MP3 or M4A for. If you need remove DRM from both iTunes M4V movies and Apple Music tracks, you can get iTunes Converter Toolkit which includes both programs but costs you less. With M4V Converter Plus, editing M4V videos with Adobe Premiere Pro is quite easy. Now enjoy video editing without any restriction.